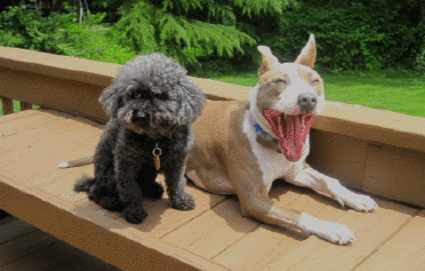 Lessons about dogs and life By: Rachel Greenspan – I have learned many things about dogs, and life, from a Poodle and a Pitbull. Ok, I know that sounds ridiculous. What type of confused family would have the world’s most prissy, princess-like dog in addition to the world’s most feared breed? Contradictory, to say the least! Rosie is the poodle. She is no more than 10 pounds, has black curly fur with strands of gray, and cloudy, cataract-filled eyes. Rosie hates other dogs but enjoys the company of people, especially those who coo over her. When we brought her home 14 years ago, I remember the Vet saying, “Do not baby her- or she will think just that”. We made a mistake. That dog thinks that she is a child. I mean, what did the Vet expect us to do with our first dog that pranced around the house in that endearing way that only little dogs can? To us, she was something that needed to be taken care of. And we did that exceptionally well. She has been very sweet all of these years, fulfilling her duties as the family pet. She sits on the sofa as if it’s her thrown, with complete awareness that she is the Alpha in the Family. She is totally harmless except for the occasional snapping of her teeth if we bother her during moments of eating and sleeping, but it’s too late to change that habit now. We take full responsibility for giving her control, but love her nonetheless. I will always care about Rosie for being my first dog, a great dog. However, 12 years later, when my brother brought home Colbie, the Pitbull, I was enlightened. Colbie is white with tan fur splashed along her muscular back and around both piercing gray eyes. She is rock solid, playful, and can often be seen with a wagging tail and a huge smile, showcasing her gorgeously sharp teeth. I am embarrassed to admit that for years I never understood why someone would own a dog like a Pitbull when you could have a stereotypically “cute” dog that elicits reactions such as “aww” from those who come into contact with it instead of “ahhh”. I was initially frightened at the idea of having a Pitbull. One Internet search of the word Pitbull and the first picture that appears is a photo of a dog that is about to attack the camera (look for yourself and you’ll see what I mean). Then there are the dog-fighting stories, the images of dogs with chains, and a physical appearance that I wouldn’t initially describe as adorable. That being said, I welcomed Colbie with an open mind. I will never forget when Colbie was about 5 months old and slept in my bed while I was visiting my family. She woke up in the middle of the night and walked all over my legs until I awoke. There she was, just standing there in the dark, gazing at me with those big eyes. I remember thinking, “What the heck is she going to do? Attack me?” She did not attack me. To my surprise, she slowly walked up to my face and gently laid herself down on the pillow by my head, trying to get as close to me a she could, in the sweetest of ways. I fell in love right there. Two years later, Colbie continues to intrigue me. When I say “Go Home!” she walks diligently into her cage, although accompanied with a pout. When I need to take something out of her mouth, she gently opens her razor sharp teeth, releasing whatever it is she has without a fight. When I am eating, she never begs for food. And when I walk through the door, she wraps her front legs around me in a hug, and proceeds to sit and cuddle in my lap (thinking that she weighs only 10 pounds). While she has these incredible traits, she comes with some challenges as well. She is full of energy and when I try to walk her, she tries to walk me. Another challenge with Colbie is managing the reactions from others. 2) While Colbie is capable of physically taking care of herself and our family, as guard-like dogs should, she needs us to protect her as well. She needs someone to stand in her corner when others are erroneously judging her. Colbie is the type of dog that makes you grow, teaching you life lessons not expected to come from an animal. When you say the word Pitbull, everyone has an idea that comes to mind. But I have found more. What I see is the most loving, loyal, humorous and patient pet. She has layers to her. She challenges every preconceived notion about the breed, proving to everyone she meets the value of the cliché “don’t judge a book by its cover”. There is depth to that. It’s something that I have always looked for in people, but didn’t realize until recently that you could also look for in dogs. While I am fully aware that her demeanor could change instantaneously, and she could demonstrate the dangerous behaviors sometimes found in Pitbulls, I hope that she doesn’t change. I am always cautious of that possibility, however, I have to trust that she will remain true to herself. Isn’t that how it goes with any relationship, whether dog or human? Primarily, above all else, you have to have trust. As both Rosie and Colbie sit side by side at my parent’s house, I see how this translates into relationships with people. You can have the partner that you think is sweet and adorable, whom you like to take care of. And that’s fine. On the other hand, you can have the protector, the guard dog, who contrastingly tries to take care of you. And that is fine as well. Or, if you’re lucky, you can have both. A Colbie. A best friend. Someone that leans on you just as much as you lean on them. Someone who makes you laugh, who might bother you at times for being themselves, but who you simultaneously love for it. Someone who you always discover new things about, who adores you for who you are, and who enables you to grow. I choose that.